I'm not surprised that the holidays are now upon us, but I didn't expect to be so busy. Other than working with my 5th graders, I've not sewn a single stitch since my retreat almost 2 weeks ago. Luckily, most of my holiday sewing is done. As promised in my previous post, I wanted to share some of the projects that I made or finished while on retreat. The biggest one is my Stash Bee quilt top. I've been hoping to take a better photo of it but every time I try it's either been too windy, too dark, or too rainy so this photo from my phone when I was on the retreat will have to do. 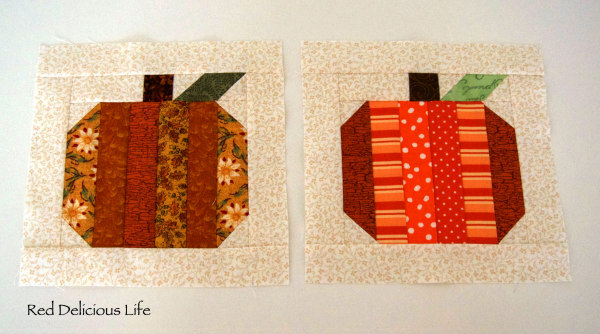 Once I start quilting it, I'm sure I'll be taking plenty! 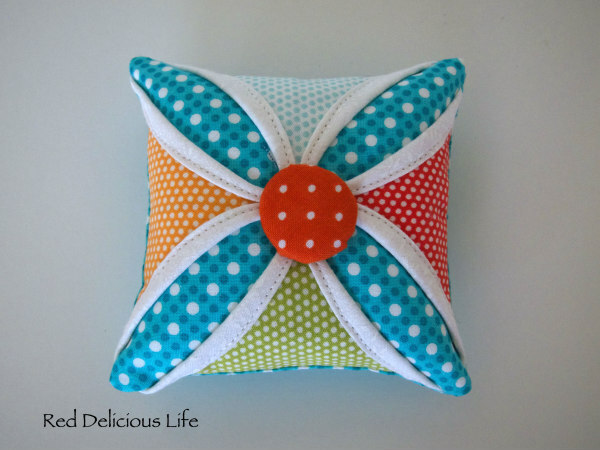 -- and a cute little cathedral window pincushion. I also made another basket that will be a holiday gift for my parents. I don't anticipate getting any sewing done next week which is okay. Time spent with my extended family is few and far between and I plan to make the most of it. I hope all of you have a wonderful Thanksgiving holiday too! 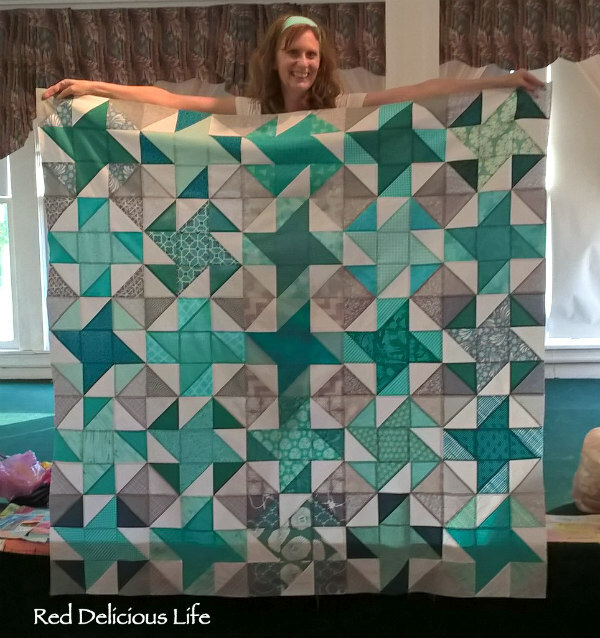 This past weekend was my local quilt guild's retreat and man did I have a blast! I really didn't know anyone in my guild yet, I'd only been a member for a few weeks and attended my first meeting last Wednesday. This was the perfect opportunity to meet other quilters, get lots of work done on various projects, and really immerse myself in creativity. The retreat was held in Central Florida in a small little town called Sebring. 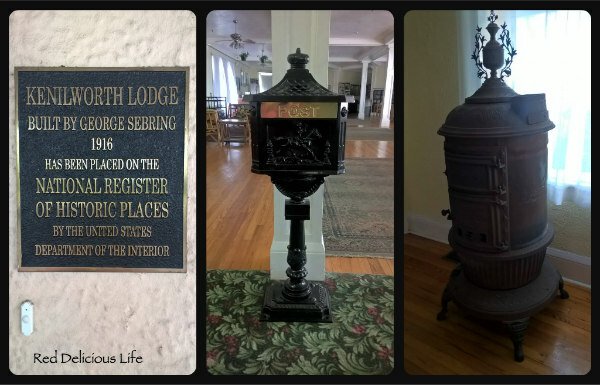 We stayed at the Kenilworth Lodge. It was built in 1916 and you could tell it was quite the resort back in the day. It's not exactly what I'd call a 5-star hotel now, but it was clean, had lots of old world charm and 2 amazing ballrooms. The plaque on the outside of the hotel and a few of the antiques in the grand lobby. There were 27 of us and I couldn't get over how much space we had. Each quilter was given an 8-foot table so we could really spread out. 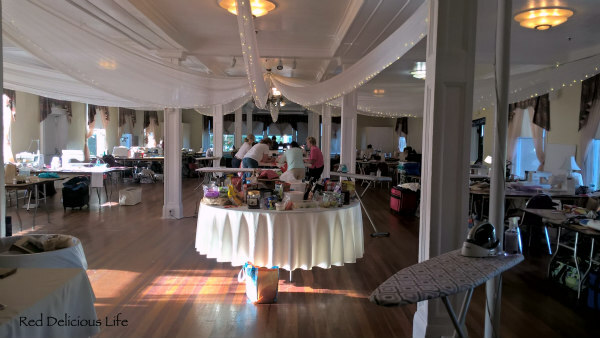 A local quilt shop provided several pressing stations with irons and even set up a small satellite store in a room just off of the ballroom so we could shop whenever we needed. The owner even left it open in case we needed something in the middle of the night - she just left a note pad on the cutting table so we could keep a running tally of anything we purchased and could settle up at the end of the retreat. The ballroom, early Sunday morning. The round table in the foreground was the snack table. The table in the back where people were congregated was the extra large cutting and demo area. I think what impressed me most about the space, was how well the staff took care of us and how well maintained the facility was. I honestly expected us to blow a few electrical fuses throughout the weekend but we never did. Think about it - 27 sewing machines, around 20 irons, personal lamps and extra lights supplied by the hotel - that's a lot of amps! The retreat itself was very informative and fun. We had one of the guild members show us how she likes to mark her quilts for free motion quilting and her techniques on spray basting. 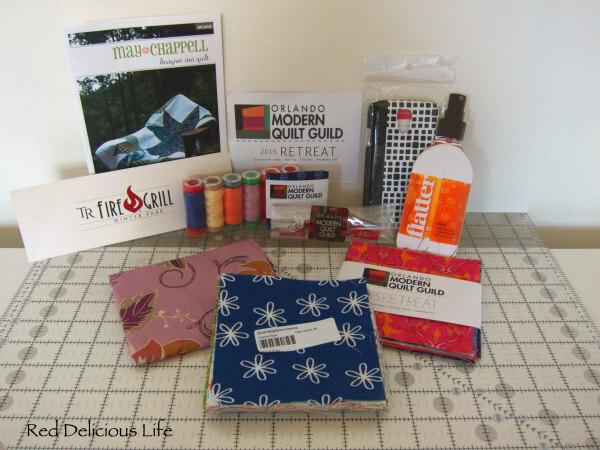 We also had lots of great sponsors who provided us with lots of swag, including Aurifil, Art Gallergy Fabrics, Patchwork Threads, May Chappell, Soak Wash, Connecting Threads, and Robert Kaufman. 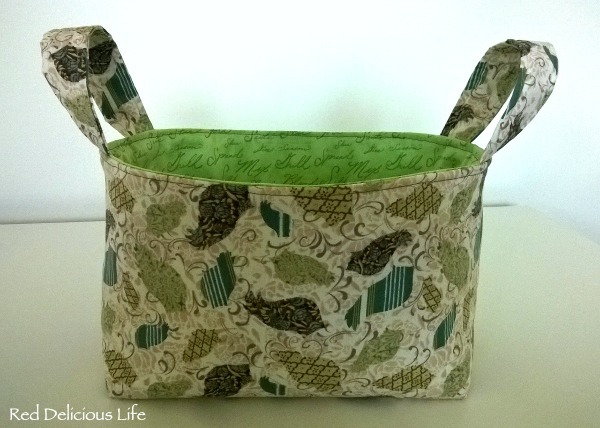 I did lots of sewing, of which I'll show in upcoming posts, and I also won this pretty half bundle of fat quarters from Connecting Threads. 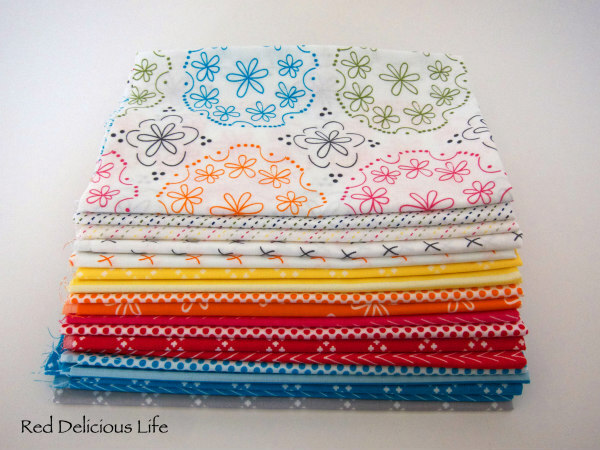 It's the Good Neighbors fabric line designed by Amanda Jean Nyberg from Crazy Mom Quilts. All in all, a super fun weekend and I can't wait to do it again next year! I was finally able to connect with and join my local modern quilt guild in October. This made me very happy since the only other quilters I know are part of the blogging/online community. Of course, on the day of their October monthly meeting my little guy was home sick with strep throat so I couldn't attend but I was able to sign up for an upcoming retreat that is scheduled for this coming weekend. SQUEAL!!!!. An interesting thing that they do at each meeting is have a block lottery. A specific block is selected each month and for each block you make, you get your name put into a drawing. If your name is randomly selected, you win all of the blocks made. 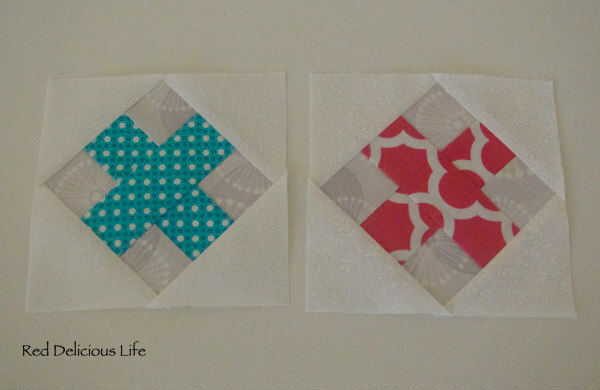 For the November lottery, the Raspberry Kiss block was chosen so I made 2 of them. Now let's hope I can attend November's meeting!